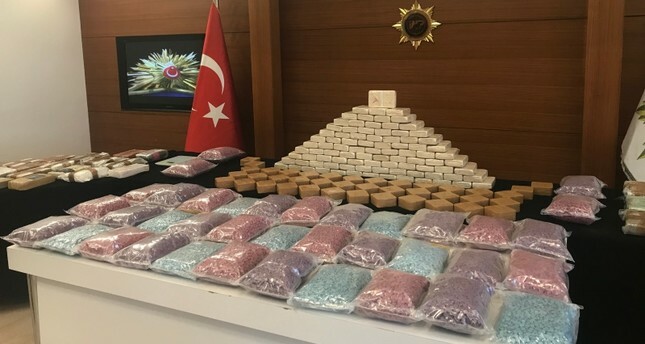 Some 115 kilogram of cocaine and heroin and more than half a million opiate pills were seized in a large-scale bust in Istanbul, a security source said on Wednesday. After receiving a tip-off, the anti-narcotics police squad raided a luxury residence in the northernmost Sarıyer district of the city on Sunday. A total of 47 kilograms (103 pounds) of cocaine, 68 kilograms (150 pounds) of heroin and 550,000 opiate pills were seized during the raid. The police arrested two suspects, a couple with two children, and presented them before a court, while their children were handed over to a relative. One of the suspects, identified by the initials O.K., was remanded in custody, while the other suspect was released under judicial control to take care of the children. The market value of the drugs is believed to be around 38 million Turkish liras ($7.04 million). Police units suspect that different types of drugs found in the same address might be related to a swap.